John Bell pleaded guilty in the April 2017 incident. 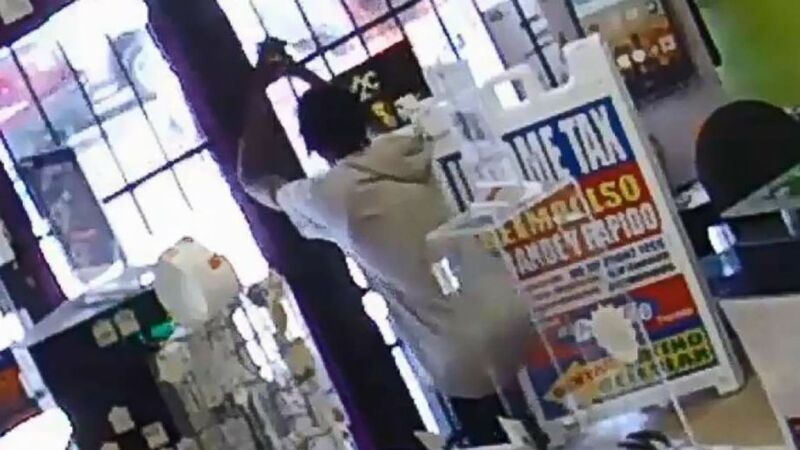 A would-be thief in Houston who was locked inside a cellphone store by an employee tried to escape by shooting the locks, and when that failed, fell to his knees to pray, according to a video recently released by police. John Bell tried to rob Latino Cellular, but an employee at the store refused to open the register and walked out along with the customers — and then locked the door, trapping Bell inside, the video shows. Store employee Katrina Leon kept a cool head when Bell ordered her to open the cash register and calmly told him, "No," the video shows. (KTRK) Houston robber gets locked in store by fleeing employees who lock the door behind them. Robber John Bell tries to shoot his way out and when that fails, prays. The windows and door had bars on them, essentially caging Bell with no means of egress. Bell attempted to get out by pumping four shots at the door’s lock, which withstood the barrage. After slamming himself against the door in an apparent attempt to force it open, Bell resorted to prayer in the hope of getting away, Houston police said Wednesday on their YouTube channel. (KTRK) Houston robber John Bell tries to shoot his way out and when that fails, prays after getting locked in store by fleeing employees who lock the door behind them. Bell’s prayers went unanswered, and police arrived shortly after and arrested him without incident. He pleaded guilty last month to the April 2017 aggravated robbery and was sentenced to five years in prison, court records show. Bell was on deferred adjudication for 12 years from a 2015 aggravated robbery charge at the time of the April robbery.